Two data security specialists that stood out from the rest this year. Despite a stream of high-profile data hacks on enterprises, this hasn't been a great year for the cybersecurity industry. Spending growth slowed as large companies decided to delay purchase decisions, pinching profit results for the biggest players. With those headwinds in mind, let's look at the best relative performers in 2016 to see what their success might say about growth prospects for the coming year. YTD = Year to date. Sales growth is for the most recent quarter. Data source: Company financial filings. Symantec, the industry's biggest player, tops the list with a slightly better gain than the overall market in 2016. The company's sales growth is the smallest in the group, but investors instead chose to focus on its improving operating trends. Revenue expanded last quarter at an 8% growth pace, which marked a solid turnaround from the prior quarter's 3% decline. In contrast, Palo Alto and FireEye are headed in the opposite direction. Palo Alto's revenue pace fell to 34% last quarter from 41% in the prior quarter, and FireEye's dipped to 13% from 19%. 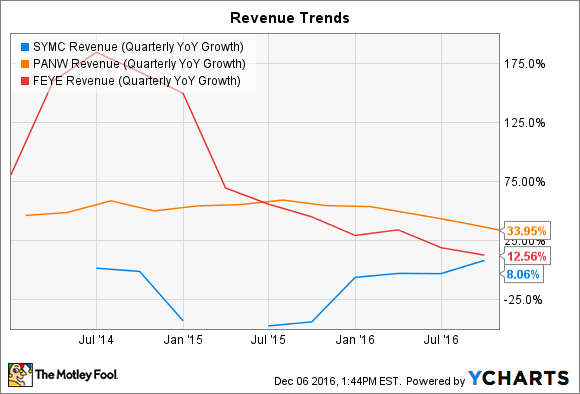 SYMC Revenue (Quarterly YoY Growth) data by YCharts. Smart acquisitions made the difference for Symantec this year. Its Blue Coat purchase helped the company exceed its enterprise growth targets by a wide margin. Meanwhile, the buyout of LifeLock promises to bolster its weaker consumer-facing division. On the bottom line, Symantec is currently suffering net losses along with its peers. But its operating margin is improving thanks to an aggressive cost-cutting program. In fact, profitability hit 29% last quarter, or a full 5 percentage points above the high end of management's guidance. That success gave CEO Greg Clark and his executive team confidence to boost their earnings forecast in early November. Cyberark specializes on protecting clients from cyber attack via exploitation of insider privileges. That focus has proven profitable for the business this year. Sales are on pace to improve by 33% for the full 2016 following two straight years of almost 60% gains. Like Symantec, the company has outperformed expectations this year, and most recently raised both its sales and profit growth outlooks. Cyberark is having better success at generating cash and earnings from its market-beating sales growth, too. At 17%, its operating margin far exceeds Symantec's 10%, even as other players struggle just to break even. 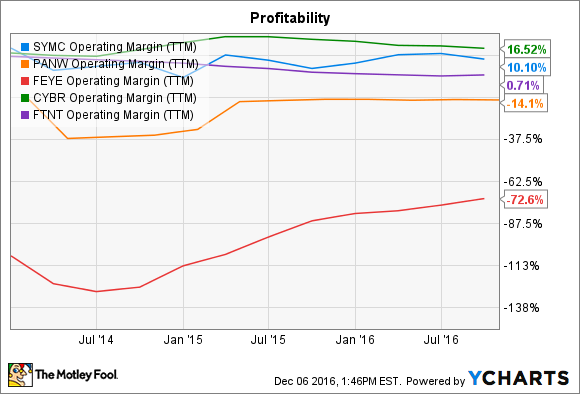 SYMC Operating Margin (TTM) data by YCharts. The company produced $39 million of adjusted profits through the first nine months of the year, up from $28 million in the year-ago period, so investors can feel more confident that net income will remain positive as it has in each of the five fiscal years. Contrast that record with Palo Alto, which has generated losses in each of the last four years, or FireEye, which hasn't yet produced a profit in its three years as a public company. Given its smaller revenue and cost base, Cyberark has a good shot at outperforming Symantec next year, assuming it continues to expand its bookings with both new and existing customers. On the other hand, for Symantec to lead the industry again in 2017, its complex buyout integrations will need to go off smoothly, and its consumer segment must contribute better results than investors have seen lately. However, keep in mind that Cyberark's valuation of nine times sales is expensive compared to the five times sales multiple that most industry players are fetching. Yet the good news for investors looking for exposure to the cybersecurity market is that all of these multiples -- except for Symantec's -- have fallen significantly this year. And that pessimism could set the stage for a more prosperous 2017.